Last night my favorite bookstore, Bookbeat, sponsored a signing event at a local library. 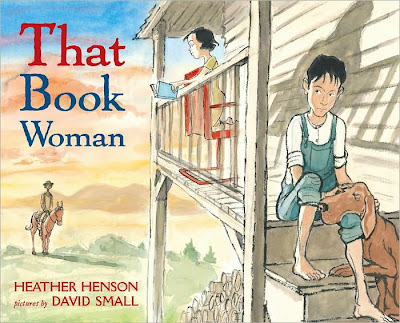 Author Heather Henson and Caldecott-winning artist David Small appeared to celebrate THAT BOOK WOMAN, a story about a Kentucky boy whose life is changed by a packhorse librarian who delivers books to his Appalachian home. I don't know that I've ever heard an entire book read aloud by its author, so it was especially fascinating to hear Ms. Henson recite her story in an authentic Kentucky accent. She then spoke about the history of the Depression-era packhorse librarians and told how she came to write the book. 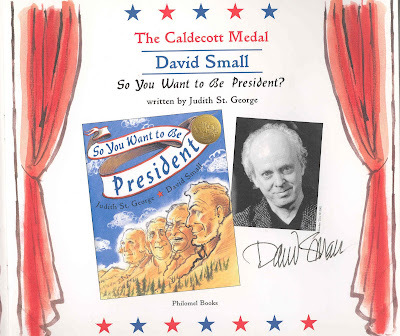 David Small explained why he made certain design decisions, such as creating a volume that is wider than it is tall and keeping the face of the book woman obscured throughout the story. He showed samples from the original "dummy" (mock-up) of the book, created on what was "essentially typing paper," and said that most of his preliminary artwork ends up in a "burn barrel" in his backyard. (Wouldn't it be every book collector's dream to rescue some of that art before it went up in smoke?) Mr. Small works in a studio only a three-minute walk from the home he shares with his wife and frequent collaborator Sarah Stewart, herself a gifted picture book author. Although Heather Henson and David Small labored on THAT BOOK WOMAN for several years, this weekend marked the first time they had ever met. Their conversation described the give-and-take process that occurs when two individual talents come together to create a work that ultimately develops a life of its own. For example, while Small obviously created illustrations to Henson's text, there were times when details of his artwork would, in turn, lead the author to make some minor changes in the story's wording. 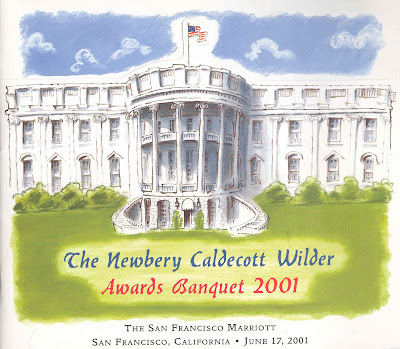 When writing the book, Henson had envisioned the protagonist as a young boy with an older sister but, in creating the illustrations, Small opted to draw Cal as an older boy with a younger sister. And he was right -- that decision makes the story both stronger and more touching. Small also revealed that, as work on the book came to a conclusion, the editor called and told him -- to his shock -- that he had forgotten to illustrate one passage. The resulting picture -- of Cal's "pap" offering the Book Woman a "poke of berries" turned out to be Henson's favorite illustration in the volume. After last night's presentation, there was time for David Small and Heather Henson to sign books. At previous author signings, I have usually tried to get a early spot in line so I can avoid the crowds and get home to, you know, watch DANCING WITH THE STARS on TV. But after a book-collecting friend told me that she usually opts to be last in line I thought I'd try out that method instead, especially since I had a number of books to be signed -- not just THAT BOOK WOMAN, but also Kathi Appelt's much-praised new novel, THE UNDERNEATH, which Mr. Small illustrated, and the Sarah Stewart/David Small Caldecott Honor Book, THE GARDENER. And since Ms. Stewart was also in attendance, that meant there was the opportunity for a wonderfully unexpected double-signing. I'm glad I hung out at the very end of the line. It gave me the opportunity to eavesdrop (er...listen in) on several conversations and learn that Mr. Small has a new book coming out next year -- an autobiography in the form of a graphic novel -- called STITCHES. My bookstore friend has seen a couple sample chapters and says he can't get it out of his head, calling it the "best thing David has done yet." Talk about a collector's item! The next spread shows that year's winners: Richard Peck (Newbery for A YEAR DOWN YONDER, David Small himself, and Milton Meltzer, who who won the Laura Ingalls Wilder Award for his body of work. Seated behind them are the chairpersons of the award committees, as well as a presidential band featuring Richard Nixon playing the piano and Thomas Jefferson on the violin. 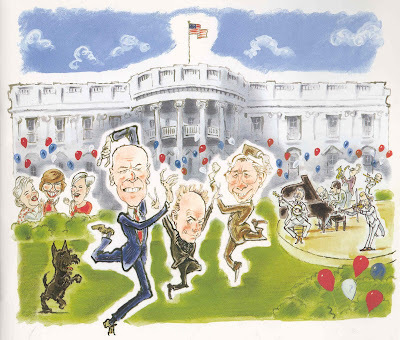 Fala, FDR's Scottie, joins in the dancing. ...And speaking of dancing, I still got home from the signing in time to catch most of DANCING WITH THE STARS on TV. However, exhausted from my busy and exciting night of meeting famous authors, I soon found myself dozing off in front of the TV...and the dancers on the screen soon morphed into the dancers depicted in my awards program banquet. 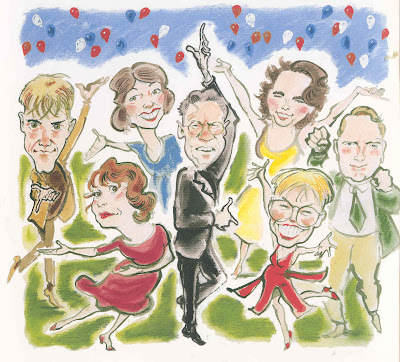 Did I just dream it, or did I hear DWTS judge Bruno Tonioli telling Richard Peck, "Reeeechard, you are a dans-ing dynamo! Each week, no matta what dans you do, you come through with flying colors. Maybe you learn to waltz by writing old-time stories like THEEE RIVER BETWEEEEN US. Maybe you learn to jive when writing World War II story ON THE WEEEENGS OF HEROES. Maybe you learn the Paso while in Mexico researching UNFEEENISH' PORTRAIT OF JESSICA. I do not know. I only know you have a deeelightful deeeversity of deft and dynaaaamic dans-ing dexterity. Bravo!" And did I hear head judge Len Goodman telling Milton Meltzer, "Now that is what I call a good old-fashioned effort, with just the right amount of welly! None of that silliness with wigs and unicycles and all that shilly-shally. Instead, you've got the kind of solid, lifelong talent that lasts for years and years while providing just the right amount of entertainment and enjoyment. You're definitely a credit to us seniors, old chap, and may I say that Cloris Leachman could learn a few lessons from you about dignity and grace." I met David and Heather and Sarah at the GLBA trade show on Sunday, but I'm still jealous. I would have followed them to BookBeat if I'd known. They are the NICEST people, and I'm a hopeless Sarah Stewart groupie. "That Book Woman," sounds like a great book! I love reading books to my kids especially if they have meaning or if they teach a lesson... for instance tonight we read "Frankie, the Walk 'N Roll Dog." by Barbara Techel- a true story about a disabled dog. I was pleased at how it taught my kids to have compassion for animals/people who are disabled. I am constantly looking for great books to read to my children and would be interested in checking out, "That Book Woman." Thanks for the tip. The NBA : Where Amazing Happens?